Meat Raffle to benefit Holy Family Learning Center!! 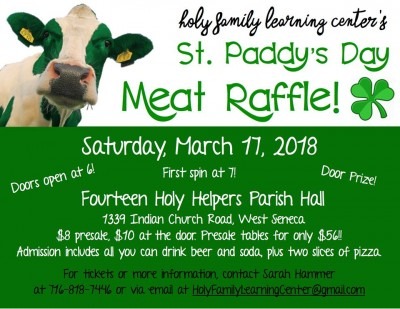 On Saturday, March 17, 2018, Holy Family Learning Center will host their second Meat Raffle fundraiser at the 14 Holy Helpers Parish Hall in West Seneca! Doors will open at 6pm with the first spin at 7pm. Presale tickets are $8, or $10 at the door, or reserve a full table of 8 for $56. Your ticket includes admission to the meat raffle, as well as, two slices of pizza, unlimited draft beer and pop, and a chance to win our door prize! A variety of meat will be raffled off during the evening and tickets will be available to purchase for our theme baskets! There will also be an opportunity to participate in our split club drawings! To purchase pre-sale tickets or reserve a table of 8, please contact Sarah Hammer at (716) 818-7446 or e-mail holyfamilylearningcenter@gmail.com. The 14 Holy Helpers Parish Hall is located at 1339 Indian Church Road, West Seneca, NY 14224. Bring your own snacks and a cooler and join us for a great night out!!! *This event is handicapped accessible. *NO outside alcohol permitted on premises. Thank you.